Why does it take imminent mortality for GOP politicos to clarify their values and make amends? John McCain, a true American hero, has put a toe in the water. But apparently he is not yet sick enough to admit that choosing the galactically inept Sarah Palin as his running mate was a dangerous mistake. Mr. Avenatti is talking about his latest evidence-backed report that Essential Consultants, the shell company Michael Cohen set up in 2016 just before the presidential election, has received deposits of at least $4.4 million through early 2018. This looks bad because Cohen has stated he established Essential Consultants only to pay $130,000 in hush money — ostensibly produced from a Cohen home equity line of credit — to Stormy Daniels to keep her 2006 tryst with Donald Trump hidden. The $4.4 million has been paid by the likes of AT&T ($600,000), who needs government approval for a massively profitable merger; Swiss pharmaceutical giant Novartis ($1,200,000), whose huge earnings are largely dependent upon American health care regulations, and whose CEO at the time received special favors from Team Trump; Columbus Nova ($500,000), a U.S.-based affiliate of the Renova Group founded by Putin pal and sanctioned Russian oligarch Viktor Vekselberg; and Korea Aerospace Industries ($150,000), who is competing for a multibillion dollar United States Air Force contract. Michael Cohen is not a registered lobbyist, a legal requirement to perform lobbying work. He is not registered to represent foreign interests, a legal requirement of American citizens representing foreign interests. Essential Consultants has no employees. It appears the company performed no work in exchange for the money. Since Tuesday night, its “clients” have been scrambling to explain these large payments and their corporate relationships with Michael Cohen, issuing multiple explanations throughout Wednesday. Novartis said that after its first meeting with Cohen, it realized he could not perform the work it was expecting but continued making the $100,000 monthly installments for a full year (the length of the contract), likely to avoid angering Trump. The companies claimed to have been seeking telecom, health care policy, accounting, and other consulting services, none of which Cohen has expertise in. On a lighter note, you can draw a straight line between the lipstick-on-animal metaphors (or are those similes?) of John McCain’s 2008 running mate, Sarah Palin, and Donald Trump’s new favorite archenemy, Michael Avenatti. By this I mean you can draw a line connecting the divisive, dog-whistling nativist politics supported by Sarah Palin to the catastrophic, full-blown racist presidency of Donald J. Trump. Sarah Palin is godmother to the tea party, the 2009 offspring produced from the union of in-the-closet bigoted Republicans and blatant ultra-right white racists who were outraged — I mean outraged — at the election of an African-American president. The tea party movement laid the groundwork for the most vile, egomaniacal confidence artist ever to befoul a television screen to become president of the United States. 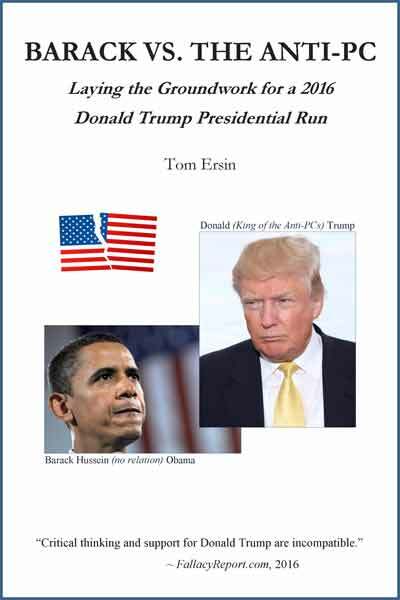 Actually, I drew that line, in detail, in my book Barack vs. the Anti-PC: Laying the Groundwork for a 2016 Donald Trump Presidential Run. In the 1988 presidential election cycle, Republican candidate Vice President George H. W. Bush was working to fend off Democratic challenger Michael S. Dukakis. Lee Atwater, Bush’s campaign manager with a notorious reputation for political dirty tricks, devised the “Willie Horton” strategy. Willie Horton, an African-American man incarcerated for murder, raped a Caucasian woman and knifed her husband during a weekend furlough from a Massachusetts prison while Dukakis had been governor of that state. The strategy — including a massive TV ad blitz featuring Willie, which portrayed Dukakis as a soft-on-crime Massachusetts liberal with ethnic sympathies — is widely believed to have worked swimmingly. The Willie Horton strategy was effective because of its unspoken implication: Vice President Bush was the only candidate in the race who would protect the citizenry from the hordes of black rapists and murderers threatening all of us law-abidin’ white people. In other words, Atwater’s marketing campaign was blatantly, transparently racist. And it worked. Now Sen. John McCain (R-Ariz.), 81, is endeavoring to reconcile his life regrets. McCain, a Vietnam War hero and highly respected Republican, is home in Arizona undergoing treatment for brain cancer, the same illness that claimed Ted Kennedy (D-Mass.) in 2009. Mr. McCain is still a senator but too sick to return to Washington to participate in legislative business. He has announced he won’t seek re-election in 2022. Realistically, many of his Senate brethren expect him to retire long before then. And most of them have discreetly brushed up on Arizona’s U.S. Senate seat vacancy election rules. The date of McCain’s retirement or death means the difference between his seat being up for re-election in 2018 (bad for the GOP’s hope of retaining Senate control) or 2020. John McCain has participated in a two-hour documentary about his life and has co-written what he says is his last book. He’s also periodically receiving a string of long-time political friends at his Arizona retreat, many of the opposing party. Jill and Joe Biden visited last week. McCain is expressing the obligatory laments about how civility and compromise in politics are almost lost in the Trump era. (What do you mean, almost?!) But he could go a lot further. Many think he should bear down hard on his criticisms of Donald, this administration, and Trumpian corruption. Keep in mind John is probably further from death than Lee Atwater was (one month) when Lee made his confessions of regret. This could explain McCain’s lack of urgency and depth as he halfheartedly revisits some things he wishes he could do over. In his soon-to-be-released book he expresses remorse for his involvement in the Keating Five (late 1980s savings and loan) scandal. He’s sorry for not speaking out — during his 2000 presidential run — to protest the Confederate flag flying over South Carolina’s Capitol building. And John McCain now says he regrets choosing Alaska Gov. Sarah Palin as his 2008 running mate instead of following his gut choice of long-time friend and Democrat-turned-Independent Sen. Joe Lieberman. McCain says nothing about Palin’s gross lack of qualifications, just that he thinks Lieberman would have been a bolder choice. But many people — even thinking Republicans — believe Sarah Palin was the epitome of political vapidity. Worse, she helped launch neo-GOP grievance politics and awaken latent Republican xenophobia, nativism, and white nationalism. There was a book and follow-up movie about the 2008 presidential campaign — both named Game Change — that thoroughly illustrated Sarah Palin’s abject unfitness to be a 72-year-old heartbeat away from the presidency. Of course, Palin and her camp called the movie “Hollywood lies.” But two of McCain’s top campaign advisers, died-in-the-wool traditional Republicans, provided much of the sourcing for the book. John McCain? Until now, he has continued to defend enthusiastically his choice of running mate since the 2008 election. 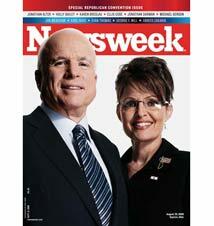 In spite of John’s mavericky-ness, he has repeatedly refused to admit he made a grave error in selecting Sarah Palin. Notwithstanding his stellar military record and independent legislative history, McCain’s words and actions have sometimes been at odds with his reputation for integrity. The problem then was that the campaign’s vice presidential candidate selection process was running out of time. McCain had held onto the idea of Lieberman as his VP pick right up until he was ultimately convinced otherwise. By that time, all they had on deck was Ms. Palin. The Republican convention was only a week away. The campaign had only five days to vet Sarah, a process that usually takes months. After the rushed vetting procedure, John met her face-to-face for the first time at his Arizona ranch and offered her the No. 2 slot on the spot. Two days later, they unveiled Sarah Palin at the convention. You should rent Game Change tonight. Why does it take imminent mortality for GOP politicos to clarify their values and make amends? John McCain, a true American hero, has put a toe in the water. But apparently he is not yet sick enough to admit that choosing the galactically inept Sarah Palin as his running mate was a dangerous mistake that would have put America in jeopardy had she ever been elevated to president. As McCain gets closer to death, he had better come out heavily against Trump and Trumpism. He has been largely a man of integrity, and the Republican Party needs him to stand up now more than ever. This week we have Attorney General Jeff Sessions announcing a new immigration policy: undocumented immigrants trying to enter the U.S. will now be prosecuted and separated from their children. We have Donald pulling out of the Iran nuclear deal, endangering U.S. security and destroying American credibility, simply because he wants to dis the former president and scuttle anything with Obama’s name on it. President Trump is publicly, seriously musing (tweeting) about pulling White House journalist credentials from news organizations that report negatively (read: factually) about his administration. We now have proof that Trump personal lawyer Michael Cohen’s shell company received at least $4.4 million in deposits from 1) a Russian oligarch close to Putin and 2) companies that wanted access to, and favorable decisions from, President Trump. Why was that money paid? Where did all that money go? Was Cohen selling access to the president? Did some of this money fund the Stormy Daniels payment? Was money funneled to Mr. Trump or Trump Inc.? Michael and Donald won’t say. And these developments are just from this week.